Natural selection is a concept described by Charles Darwin as a basic and fundamental mechanism of the theory of evolution. The term was introduced in his popular book, "On The Origin of Species," in 1859. Natural selection describes the process by which advantageous traits that allow for better adaptation within an animal population become more common over generations, thus changing the genetic composition of that population. Natural selection is evident in humans as well as many animal species. The process of natural selection relies on a few factors. First, variation within a species is necessary. Individuals must vary in appearance or behavior. In addition, certain traits are more advantageous than others with regard to adapting to the environment and allowing for more reproductive and survival success. Finally, the variable traits must be inherited by offspring. Individuals with the beneficial traits will survive and pass those traits to their offspring. That trait will then increase in frequency, changing the genetic composition in subsequent generations, assuming it remains beneficial. 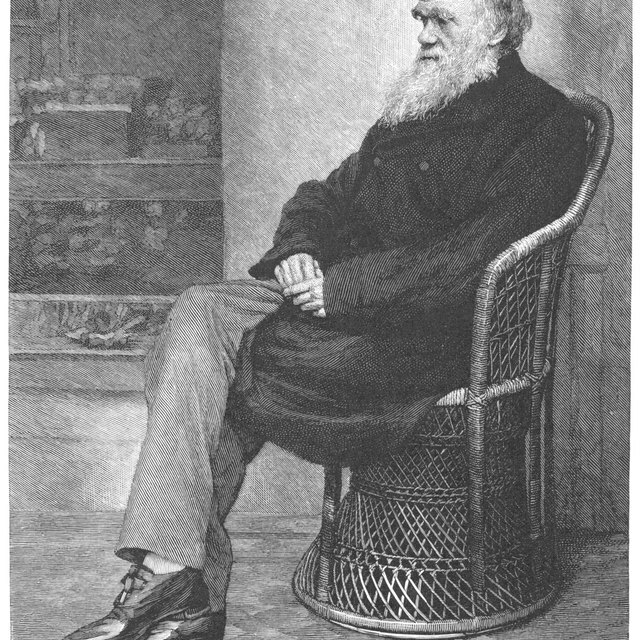 The Galapagos finches studied by Darwin on his famous voyage are probably the most common example of natural selection. Each Galapagos island had its own species of finch, all very closely related. Darwin noted that the finch’s beak sizes and shapes were all adapted for the specific type of food that species ate, such as small seeds, large seeds, buds, fruit or insects. This adaptation suggested that their beaks evolved due to natural selection. Beak characteristics were essential to survival, and those individuals with the right shaped beak to reach the food would survive and pass that beak shape to its offspring. Like the finches, other animal species provide evidence of natural selection through certain physical adaptations. In England, the peppered moth, Biston betularia, has two forms, a light and dark colored form. In the early 1800s, the lighter moths typically blended better into their surroundings, whereas the darker moths stood out on the light-colored trees and were more quickly eaten. The light colored moths were therefore very common and the dark color were rare. After rapid industrialization, however, when coal-burning factory pollution and soot began darkening the trees, the dark moths blended better into their surroundings and they were now more likely to survive. By 1895, 95 percent of the peppered moth were dark colored. Natural selection typically works against the organism, eliminating the individuals that are not suited for the environment. For example, a population of pest insects frequently encounters pesticides in its environment. Most insects in the initial generation die, but if a few individuals have a genetic mutation for pesticide resistance, these few will survive and reproduce. Their offspring are more likely to be pesticide resistant. Within a few generations, the pesticide is less effective because most individuals are resistant. Quinlan, Sarah. "Examples of Natural Selection in Animal Species." Sciencing, https://sciencing.com/examples-natural-selection-animal-species-3667.html. 10 March 2018.